IT service management (ITSM) has long been a huge benefit to complex and exception-rich IT operations by helping to standardize, automate and apply a common system-of-record approach to tasks, incidents, assets, and workflows. ServiceNow has been growing rapidly as a software-as-a-service (SaaS) provider of ITSM, but clearly sees a larger opportunity — making service creation, use, and management a benefit to nearly all workers for any number of business processes. It’s one of those rare instances where IT has been more mature and methodological in solving complexity than many other traditional business functions. Indeed, siloed and disjointed "productivity applications" that require lots of manual effort have been a driver to bring service orientation to the average business process. Traditional applications in any business setting can soon reach their point in inflexibility and break down and therefore don’t scale. Just as in IT operations and performance monitoring, traditional applications in any business setting can soon reach their point in inflexibility and break down and therefore don’t scale. Despite human productivity efforts — via shuffling emails, spreadsheets, phone calls, sticky pads and text messages — processes bog down. Exceptions are boondoggles. Tasks go wanting. Customers can sense it all through lackluster overall performance. So ServiceNow this week launched its Eureka version of its online service management suite with new features aimed at letting non-technical folks build custom applications and process flows, just like the technical folks in IT have been doing for years. Think of it as loosely coupled interactions that span many apps and processes for the rest of us. Now available globally, the fifth major release of ServiceNow includes more than 100 changes, new modules, and has a new user interface (UI) that allows more visualizations and drag and drop authoring and is more "mobile friendly," says Dave Wright, Chief Strategy Officer at ServiceNow, based in Santa Clara, CA. IT does, however, get the opportunity to vet and manage these services, and can decide what gets into the service catalog or not. Those of us who have been banging the SOA drum for years, well predicted this level of user-driven services and self-service business process management. I, for one, am very keen to see how well enterprises pick up on this, especially as the cloud-deployed nature of ServiceNow can allow for extended enterprise process enablement and even a federated approach to service catalogs. Not only are internal processes hard to scale, but those work flows and processes that include multiple companies and providers are also a huge sticking point. Systems integrators and consultancies may not like it as much, but the time has come for an organic means of automating tasks and complexity that most power users can leverage and innovate on. With this new release, it’s clear that ServiceNow has a dual strategy. One, it’s expanding its offerings to core IT operators, along the traditional capabilities of application lifecycle management, IT operations management, IT service management, project management, and change management. And there are many features in the new release to target this core IT user. Additionally, ServiceNow has its sights on a potentially much larger market, the Enterprise Service Management (ESM) space. This is where today’s release is more wholly focused. Things like visualization, task boards, a more social way of working, and use of HTML 5 for the services interface, giving the cloud-delivered features native support and adaptability across devices. There is also a full iOS client on the App Store. But as a cloud service, ServiceNow, if it attracts a large clientele outside of IT, could prove sticky too. That’s because all the mappings and interactions for more business processes would be within its suite — with the common data model shared by the entire ServiceNow application portfolio. 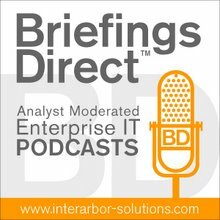 The underlying portfolio of third-party business apps and data are still important, of course, but the ways that enterprises operate at the process level — the very rules of work across apps, data and organizations — could be a productivity enhancement offer too good to refuse if they solve some major complexity problems. Strategically, the cloud provider that owns the processes solution also owns the relationship with the manager corps at companies. And if the same cloud owns the relationship with IT processes — via the same common data model, well, then, that’s where a deep, abiding and lasting cloud business could long dwell. Oh, and its all paid for on an as-needed, per user, OpEx basis. As a cloud service, ServiceNow, if it attracts a large clientele outside of IT, could prove sticky too. Configuration Automation -- an application that controls and governs infrastructure configuration changes, enhanced to work in environments managed with Chef data center automation. For more, a blog post on today's news from Wright.